A series of art tutorials and utilities. You are given advice and guidance from your teacher, Vince, as you learn artistic techniques. 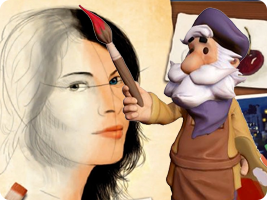 Rather than simple digital painting programs, the skills you learn are applicable to real materials, such as canvas and oils. Complete the pre-set artistic challenges or create your own masterpieces and share them with friends.